Buying new toys for your kids is par for the course during the holiday season. However, if you live in a developed nation like the United States, it's easy to ignore how these toys actually make their way to your local store and into your child's hands. Many toys are shipped into developed countries after being made by adults and minors in other countries, often under unethical, and sometimes scathingly horrid working conditions. 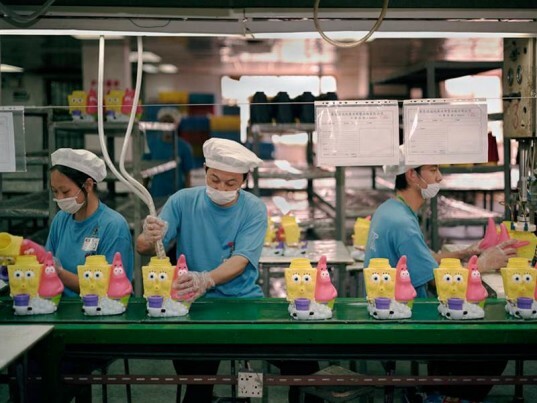 Many factory laborers are paid almost nothing, work insanely long hours and often toil under totally toxic conditions simply so that companies can sell toys for a mass profit. It's something to think about, because any toy made unfairly, via forced labor and unfair working conditions is nowhere near approaching the merry or ethical holiday season I know you want to have. 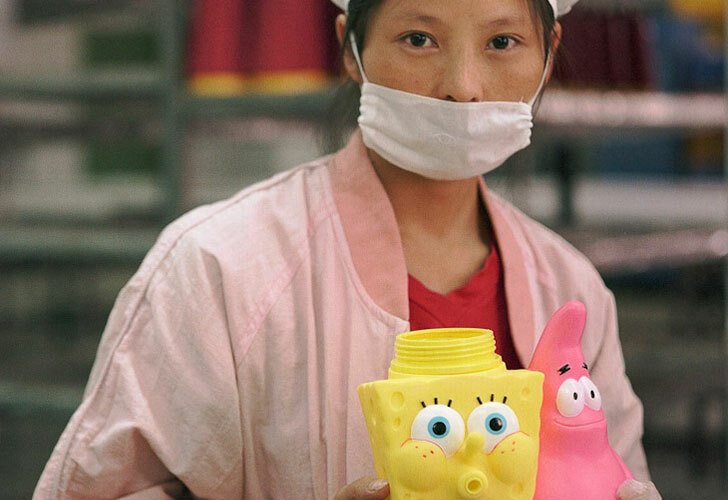 If you've turned a blind eye to poor working conditions in other countries, photographer Michael Wolf's revelatory series 'The Real Toy Story', will make you think twice. 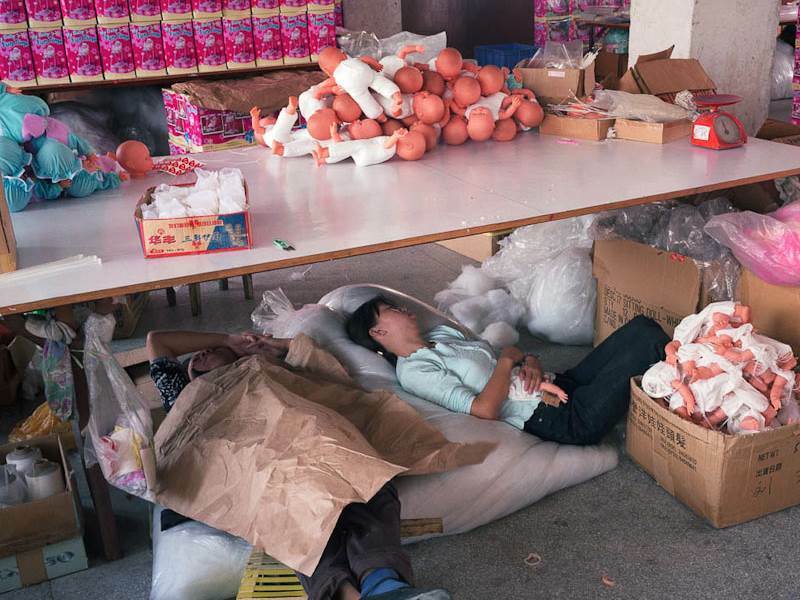 Wolf's pictorial captures life inside a toy factory in China and shines a light on the reality of how toys are truly "made in China." Take a closer look at this series and find out how you can be part of the solution vs. the problem. Conditions in many toy factories across the world are extremely unseemly and often downright horrid. 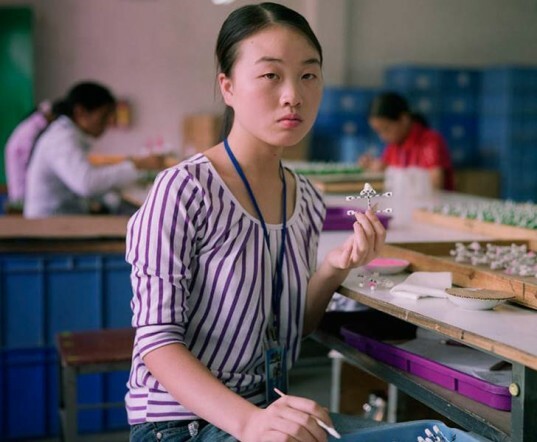 For example, in 2008, the New York Times reported that Chinese workers, often as young as 16, face some serious health hazards on the job, such as in the Pearl River Delta region near Hong Kong, where, “Factory workers lose or break about 40,000 fingers on the job every year.” A more recent undercover investigation found that huge companies such as Disney, LEGO and Marks & Spencer pay, “Only a fraction of the shop price of products to the factories that make their products.” This undercover report also found that workers were often working up to 140 hours of overtime a month, were paid up to a month late, were expected to work with dangerous tools and machines without training or safety measures, and had to work in silence and were fined up to £5 for going to the toilet without permission. 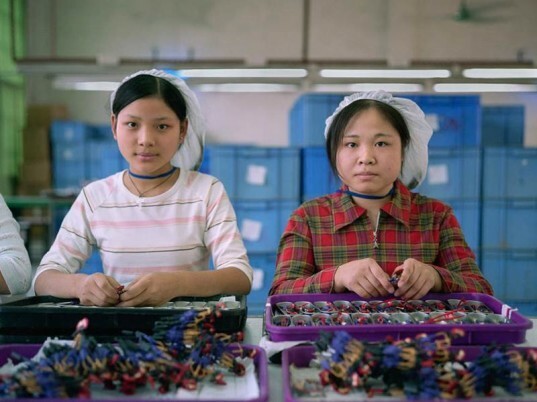 Other insane policies of non-Fair Trade toy factories included separating parents from their children for a few days to a year, frequent injuries, toxic chemicals, extremely sub par factory living standards such as no water for washing and flushing toilets after 10pm, zero days off, 14 hour work days and much more. Learn more in the links below. In the USA we’re very concerned about exposing our children to lead, toxic paint, BPA and other chemicals that may harm them, but imagine what workers in toy factories are exposed to? Chemicals and toxic issues affect workers in toy factories to an alarmingly detrimental extent. For example, many workers are constantly exposed to oil-based paints, toxic solvents such as benzene, and other chemicals, and the fumes from chemicals hang in the air while almost zero safety precautions are in place. Most workers do not have access to gloves or even basic respiratory masks. Aren’t People Just Thankful to Have Jobs? It’s easy to feel removed from forced and not-forced, but low-wage child workers here in the USA and other developed countries, but it’s not an imaginary problem. A recent report from risk analysis firm Maplecroft shows that child labor is still a huge problem in many countries today, including Eritrea, Somalia, Democratic Republic of Congo, Myanmar, Sudan, Afghanistan, Pakistan, Zimbabwe and Yemen. Child labor affects everyone as many of the products imported into America and other countries for consumers to enjoy are made by the hands of children. Beyond toy factories, many chocolate companies still use child labor. All in all, the International Labor Organization estimates that around 211 million children between the ages of 5 and 14 are working in factories around the world, but it doesn’t have to be this way. Check out the links below to learn more. The biggest toy industry players would have you believe that unsafe working conditions, child labor, low wages, forced overtime and chemical hazards are simply media-oriented declarations or pure fairy tales. But as you can see from Wolf’s photo series herein, along with the many links to reports provided here, unfair, unethical and dangerous working conditions are no fairy tale. Families all over the world are exposed to sweatshop problems. If you’re not on board with sweatshop toys, then there are steps you can take, such as buying locally made eco-friendly toys, making your own holiday gifts for kids and purchasing toys from companies you know are Fair Trade and ethical. Most importantly, you should avoid buying toys from companies who run shoddy factories or who use low wage child labor and suggest your family and friends do the same. I also highly suggest you read Green America’s Economic action to end sweatshop and forced child labor and the Shop with a Conscience Consumer Guide. 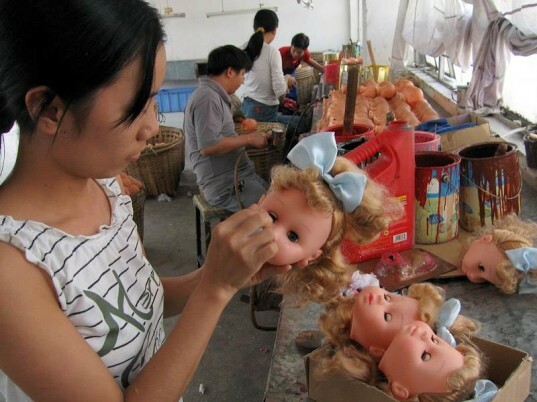 In the USA we're very concerned about exposing our children to lead, toxic paint, BPA and other chemicals that may harm them, but imagine what workers in toy factories are exposed to? Chemicals and toxic issues affect workers in toy factories to an alarmingly detrimental extent. For example, many workers are constantly exposed to oil-based paints, toxic solvents such as benzene, and other chemicals, and the fumes from chemicals hang in the air while almost zero safety precautions are in place. Most workers do not have access to gloves or even basic respiratory masks. Aren't People Just Thankful to Have Jobs? Jobs are good, we all know that. 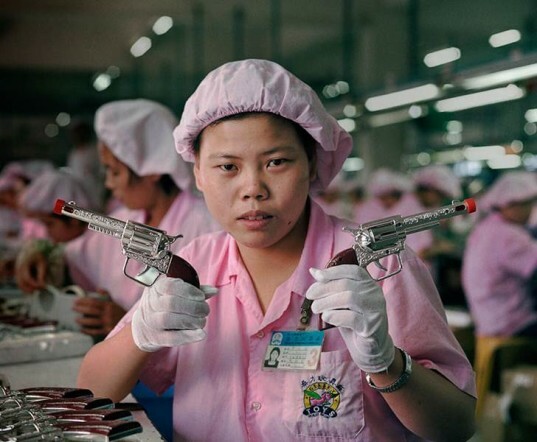 However, the International Labor Rights Forum sums up the issue of "lucky to have any job" with the following and it makes perfect sense: "Having a job in manufacturing or on a company farm should not mean having to be subjected to starvation wages, physical and verbal abuse, excessive overtime or a life threatening work environment. Nor should workers be deprived of the right to bargain collectively. Workers want to be treated with dignity, and expect to be able to support themselves and their families with their earnings. These conditions could easily be addressed by companies." If you're not on board with sweatshop toys, then there are steps you can take, such as buying locally made eco-friendly toys, making your own holiday gifts for kids and purchasing toys from companies you know are Fair Trade and ethical. Most importantly, you should avoid buying toys from companies who run shoddy factories or who use low wage child labor and suggest your family and friends do the same. I also highly suggest you read Green America's Economic action to end sweatshop and forced child labor and the Shop with a Conscience Consumer Guide. + "The Real Toy Story"